The 3 modifications of the bridge exercise. When you can’t exercise standing or sitting, this is the next best thing. Because this is a strength exercise, only perform this when you can move and stretch with no pain. Sit on the floor and put your heels as close to your body as possible. Slowly lower your body to a flat position. Repeat step 3 in the basic bridge. Use your back muscles to raise one heel without shift your body weight. Hold for 2 seconds then lower to a flat position. Use your back muscles to raise your entire foot off the floor without shifting your body weight. 3. Hold for 2 seconds then lower to a flat position. 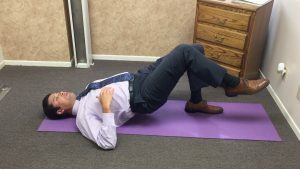 Use your back muscles to raise and straighten your leg without shifting your body weight. For each modification, raise and lower the left and right three times for 2 seconds to start . Then add more time after the back feels stronger. Your stronger back will give you confidence to move without injury, and improve your balance. Stand up in a relaxed position. If desired, use a stick for balance. The 6 motions are normal if you can go to the minimum number of degrees AND is PAIN-FREE. If any of your motions are limited and/or painful get check for a spinal condition to prevent nerve, muscle and joint conditions. Danny had come to our practice about a year before this testimonial. He was unable to get the treatment, until 3 months ago. This time, Danny was patient to see the improvement: on his x-rays and feeling better. This is Danny’s story of recovery. Danny came to Euclid Chiropractic 3 months ago knowing he could no longer work with the intense pain he was experiencing in his back, shoulders, neck and legs. He did not want to take addictive medication or get the shots for pain relief. We had taken Danny’s x-rays about a year ago and showed the deterioration over the last 9 months. Now Danny understood he needed to take the time to recovery from his physical laborious work, or he might end up in a wheel chair. So starting care at Euclid Chiropractic included consistent treatments beginning with adjustments and physical therapy. Then stretches were implemented when the pain reduced. Lastly strength exercises were included once he was able. This gave Danny the confidence his body was getting better. After three months of care, Danny’s x-rays were retaken and showed improvement. This objective finding along with feeling better with strength exercises gave the doctors and Danny the confidence that he could go back to work AND stay better. In part 6, having normal spinal joint motion stimulates the parasympathetic nerves to allow the adrenal glands to release relaxation hormones (adrenaline, serotonin) to keep the body relaxed (your muscles, brain, organs, etc.). This leads your body to recharge when you sleep, giving you more energy, keeping you healthy. Danny recently produced a video testimonial of his recovery through Euclid Chiropractic (link below when video uploaded). We were able to show him the structural improvement that occurred from his before treatment x-ray and post treatment. With Danny’s narrowed disc spacing, it is evident there is a lack of motion in the spinal joints. When this occurs, the spinal fluid cannot circulate in and out of the disc. Then, the disc will shrink closing the spinal canal where the nerve can pinch to cause neuropathies. With more spinal motion caused by the adjustment, the spinal fluid can circulate to rejuvenate the discs. This causes the disc to hold more fluid and increase in height to take pressure off the nerve by widening the spinal canal (explained in the video). Three months after starting consistent treatment, Danny’s pain level has gone from a 9 to 1, his weakness/pain is gone and his feels young again. Now Danny can work and enjoy his family and basketball without pain and more energy. He has a better quality of life. Shantal came to our office after a severe car accident. As young as she was, the pain would not go away. Looking at the x-rays, their appeared to be severe strains throughout her spine. Shantal understood if the spine healed with no motion caused by the accident, then it could lead to scar tissue and damage in the future. Shantal received consistent adjustments and physical therapy for several weeks. When she was ready, the doctors started a rehab routine to help stretch and strengthen her body with the proper posture. This treatment plan helped improve the spinal motion to reduce the neuropathy and pain; along side, Shantal felt her posture improve and back strength. Watch Shantal tell her story.